Xylem’s Godwin NC150S is a smart dewatering pump for tough applications. Global water technology provider, Xylem, has launched its first-in-series smart dewatering pump – the Godwin NC150S – as part of its new Godwin S Series. The pump offers new levels of control, remote flexibility and sustainability and is intended for tough dewatering applications. The company says the NC150S has been designed to reduce service time by 40% with less frequent service intervals. The improved belt tensioning system means there is no longer any need to separate the pump from the engine for compressor belt service and the new cartridge-type mechanical seal speeds up installation. The sight glass also makes it easy to tell when seal housing oil needs replacing and a 25% increase in pump shaft diameter enables longer pump life. In addition, the NC150S has optional Godwin Field Smart Technology (FST), a first-in-industry telemetry and wireless technology that provides smart remote monitoring and control from any smartphone, tablet or desktop computer. 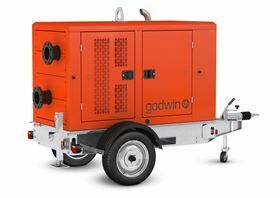 The new Godwin series also incorporates Xylem’s unique Flygt N-Technology; the company’s non-clog impeller. With its self-cleaning capability and hydraulic efficiency, it is designed for high performance levels in the most demanding environments, including those with high-rag and fibrous content.